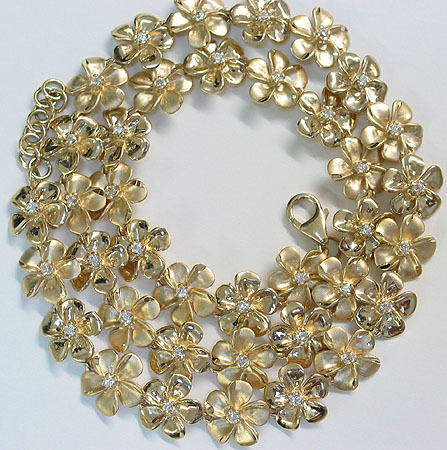 Solid 14k Gold Plumeria Hawaiian Necklace with Alternating Satin Finish and High Polish Finish Flowers. Made in Hawaii. Flowers are 12mm. Weight is approximately 2.35 grams per inch. Includes cubic zirconia. Size is adjustable up to 1 inch. Comes in your choice of yellow, white, pink, or tri-color (each flower a different color) gold.